This stairway has a wood handrail and treads with balcony rail to match. The stair is 60" diameter with 22 1/2 degree treads. 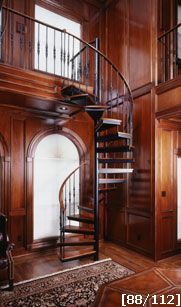 The handrail is # 247 (2 1/4" x 1") oval mahogany wood. Balusters are a # 326 (hammered forged) taper from the ends up to the center to a collar, two per tread. The treads are # 120 (12 gauge) pan type steel. The wood overlay is # 140 (1") thick mahogany with a nosing. At the top is a 1/4" x 2" mounting plate which mounts to the existing landing platform. The balcony rail is 42" high with balusters, spaced at 6" on centers, to match the stair. The center column is a 3 1/2" ID steel schedule 40 round pipe. The finish is standard black paint and the wood was finished, by others, after installation.